Q: Jenson, if we could start with you: officially you're on option for 2018 but as there's a chance this could be your last Formula One grand prix tell us about the adventure of the last 17 years? Jenson BUTTON: Wow, we could be here for a little while! First of all I go into this thinking it's going to be my last race. I think that's the best way to be and at this moment in time I don't want to be racing Formula One past this race, and that's the whole idea. Anyway, I think of this as my last race and hopefully everyone else does as well. Yeah, it's been a long journey. Since eight years old until now I've been racing in motorsport and everything before Formula One was work to try and get to Formula One. You get to Formula One with many dreams and you aspire to be something and hopefully you leave the sport with memories. That's something I definitely do have from my 17 years of racing in Formula One. Lots of amazing memories, lots of life-changing memories - some good, some bad - and also to walk away with the world championship is a very special feeling as well. To race with two of the teams that I dreamt of racing with when I was a kid - Williams and McLaren - and when I did win the world championship it was with a privateer team, which I think is also pretty special. Obviously a very memorable year of my life and in the future it's something I'll hopefully be telling my grandchildren all about, how we came from nothing and we ended up winning the world championship. There are so many memories that I can't put them all out on the table right now, but that's a small snippet of my career. Over 300 grands prix. I will definitely step away from Formula One happy with what I've achieved and knowing that my life really does start now. Button: You always hope changes that you make for that reason do work of course. I think there's still a lot more going on before next year. But of course I will still be working at McLaren-Honda, so yeah you hope that that the change will be positive. New outlook, fresh ideas and certain things that have changed the team definitely needs and hopefully we can put that to good use next year and in the future. Felipe MASSA: It's difficult to describe. It was such an amazing feeling. The first moment after I crashed I was not happy because I wanted to finish the race. My last race at home... I even prepared a Brazilian flag in corner one to do the lap and I was so disappointed to finish like that. But then when I started to walk and I started to kind of talk with the grandstand I just had an amazing feeling. I started to cry, I couldn't hold. That walk I was doing was like forever. It was an amazing feeling; it's impossible to describe what I was feeling. And then when I get to the pit lane, I saw all the teams out, I couldn't believe. It is still in the middle of the race and the race just stopped. For that... that feeling is just impossible to describe, how emotional it was and how thankful I am for everything that I pass through this year. The only thing is to say thank you for everybody, including you guys, including everybody that was around me for this period that I was racing Formula One. I really hope Jenson feels the same here in this race, because it's a very special feeling and a very special emotion and I'm really thankful for everything that I passed through. And as Jenson said, I'm so happy and proud of my career, even if I couldn't have the title like him, I was missing one point but anyway I'm so proud for everything I passed through, everything I worked with, or friends, incredible and difficult moments... it was really an amazing feeling. Massa: With a good result! That's what I wanted to finish with also in Brazil! I'm really looking forward that we can have a nice race here. I think a good result is what gives you more happiness. I managed to finish here second two years ago. I know it will be not easy to get the same this race, but if you can take the best out of the car, if you can do a good race that is when you feel happy. Kimi RAIKKONEN: I mean I left once already so I kind of know how it feels. Obviously, it's their choice and I'm sure they will have a lot of fun and I wish them all the best for whatever they do in their lives. For sure, things will change in F1 in the future and all of us will leave one day and that's just how it goes. They've both had a good long career in it and I'm sure they will have some other things to do now. Q: Your world title win in 2007 is a good example that anything can happen in a Formula One title showdown race. Hamilton needs something similar to what you got to win the title on Sunday. Tell us how you approach an 'anything can happen' mentality and what do you think will happen on Sunday? Raikkonen: I don't know what will happen on Sunday obviously, we'll see on Sunday and over the weekend. When I was in that situation obviously we had nothing to lose, so we go as any other race. We had a strong weekend and a strong last part of the year so obviously that helped. I don't think there's a point in doing anything different than you normally do. You always come to a race and try to do the maximum. Our only chance was to try to win and then see what happens to the other guys. As a team they did a very good job of it and then obviously had some luck involved and all things fell into place, so who knows what will happen on Sunday but whoever wins deserves it. Felipe NASR: Well, first of all, nice words from these two guys here. I think they both achieved a lot and I definitely... when I was younger I saw them racing and to see them going now is something hard to see. But as I say they both achieved a lot. Talking about Brazil, I wouldn't imagine a better way of doing it, in my home race, these two points really felt like a victory for us, for the whole team. We have been going through such a difficult year and it was looking like quite an impossible way of achieving those points. But with all the rain, the difficult conditions we had in Brazil, I knew there was going to be an opportunity. It was difficult for everybody. It was a tricky race and when I crossed that finish line and I saw these two points were ours it was an incredible feeling because I know how much we put ourselves in a position... of such hard work to overcome this situation. Saying that, nevertheless we have a last race here to confirm that so we go to keep focused on the weekend and make sure we get away with those points. Nasr: I would expect that it does help for sure. If anything that a racing driver can do is to contribute to a team with points and I know how much these points are valuable. Let's put it this way, we know how much these points mean in terms of the championship the points and the restructuring the team will take for '17, so it's the best, the best I could have given them. Q: Thanks for that. Finally to you Max, you were cast as the bad boy of Formula One not long ago and now you're being billed, after Interlagos, as the new Senna. How do feel your image and the way you fit in here in Formula One has changed after Brazil? Max VERSTAPPEN: Difficult to say. I don't think that's up to me. I just try to do the best possible race I can. I was definitely enjoying myself in Brazil but I'm not sure if it has changed something for me personally in terms of my reputation. Verstappen: We'll try. I think they will be very strong in the dry anyway, so it will be difficult to beat them but hopefully we can be very close. That would be very positive for us. Q: Max, since the Brazilian Grand Prix you've been quoted in an interview saying that part of what gave you the skills to perform the banzai drive that we saw in the wet were your years working your way up through karting and Formula 3. Could you elaborate on how the previous racing categories gave you the skills to impress as you did last week? Verstappen: I think everybody here did go-karting so you always learn from that as well, but it's just also when you are not in a competition and you are just having fun with friends, for example, you are driving on the snow or whatever. You are always trying something different; you're sliding and you're still competing against your friends, trying to have fun in one way but still trying to beat each other in something. That's what I've always done in winter time for example and somehow in a fun way you are still improving your skills. I think that definitely helps a lot. Then, together with my dad we practice a lot in those circumstances, also in the wet, he was helping me a lot, especially when I was six or seven years old. He was even standing on the track showing me where to drive, trying to find different lines and that definitely helped me a lot our there in Brazil a lot. Q: (Andrew Benson - BBC Sport) Jenson you have been pretty unequivocal now about your feelings about this being your last race, but it wasn't quite presented in the same way initially. Why the change between Monza and here? Button: Nothing's changed. I've just gone into this last race thinking that it is my last. I don't want to go into this race thinking that it's not my last and it is my last. It is true that I have a contract for 2018 but at this moment in time I don't want to be racing in 2018. But the whole idea about having a contract was that in three months' time, when I've eaten myself stupid and I'm thinking of things to do in the future and I feel like I need Formula One back in my life, but at this moment in time that isn't the case. So this is my last race, that's the way I think about it at the moment, but who knows that could change in six months, eight months, one year. Q: (Seff Harding - Xero Xone News) For Felipe and Jenson: as you two get ready to leave the sport there are a lot of changes coming in 2017, what are your hopes for the future of Formula One as you leave the sport? Massa: Well, I hope to be honest what everybody hopes: to see Formula One more competitive; to see more than one team fighting for the championship; to see more drivers winning the races. That's what everybody has hoped since a long time in Formula One. That's what I hope to see when I am watching the television, to see these guys fighting, not to see only one guy winning the races or maybe only one team. So that's what I hope. Button: Yeah, I totally agree. I think coming up through... starting in 2000 and racing here in 2016 the sport has changed quite a lot - a lot for the positive. There are always going to be negatives, especially when you are trying new trends and technologies and what have you. But the main reason why I think people turn on and watch Formula One is the fighting, seeing different teams and different drivers fight for every race. For sure we've had it in the past when the have only been two drivers fighting for the championship but it's been with different teams. Basically Mercedes are doing too good a job and nobody else is doing a good enough job right now. We are all working hard to catch up but it's tough, because they are very competitive. I think that is what's going to attract people more next year, if there are more teams fighting at the front, different drivers winning more races, because at the moment if nothing goes wrong with Mercedes, if they don't have any issues, they win the race and a bad result is finishing second to your team-mate. That's something that needs to change but obviously we will see if it does. Hopefully the rule changes, which are very big, will help other teams find a new direction and close the gap, because that's exactly what we want to watch, as Felipe said, and it's the only reason I'll be watching Formula One next year. Q: (Alan Baldwin - Reuters) Felipe Nasr, you're the only one up there whose future is not clear at the moment. What is the position? Are you taking to Manor? How\'s it going at Sauber? Nasr: There are still negotiations going on. The talks are with Sauber mainly. That's our priority right now? As I said, I have a great relationship with the team. It's been two great years. We saw the two sides of the coin. Then first year I had in Formula One I was able to do so much, to achieve so much in a very first year. The second, we had such a difficult time, the car being uncompetitive, but it was nice that we were able to get those two points in Brazil. I'm sure that has given a boost to the team. These two points mean a lot for myself, for the team and hopefully we will know it soon. Q: (Jerome Pugmire - AP) Question for Max. Given how well you've raced this year, especially the victory that you got and also the performance in Brazil, what are your objectives for next season? What do you see as realistic for you to achieve? Verstappen: I think maybe that all depends on the package you get around you, you know? So if it's the fastest car on track, for sure we can win races. So, we'll see. I think we're all very positive about next year but I think it's important to just wait and see when the car gets to the track. Then we'll know more. At the moment it's a bit difficult to say what exactly what I want to achieve for next year because you don't know what the packages are. Q: (Livio Oricchio - Globoesport) To Jenson and to Felipe. With 17 and 15 years of experience in Formula One, what would you do differently to what you did in the past? Button: It's a good question but I think for both of us our job is not to look back. It's to live in the moment right now. This our last race and I think we're both looking forward to getting out on the track. There's no point trying to change the past because you can't. You've got to learn from your mistakes and move forwards. It's living in the moment and looking forward to the future. Massa: I think it's the same. To be honest, you do so many things in this long time of your career. Maybe one or the other you would try to do different now - but I mean, to be honest, I'm really happy for everything I did, really happy for everything I learned. Even with a difficult situation, that it happens, maybe I would do it differently yes, but I was always professional and I gained more by doing that than by doing different, so I'm really happy for everything I passed through and everything I learnt. Q: (Abhishek Takle - Mid-Day) Question to Felipe. You spoke about the emotional send-off you got in Brazil. I wanted to ask you, at the end of the day, leaving with that sort of respect and regard, does it count for me than the trophies and the championships? Massa: Definitely. I think that is what you represent in the human side. That's really than a lot bigger than a simple trophy. That really represents a lot and the respect, how you are, I think that's really important for me as a person. Definitely. People not just looking at you only as a driver, people looking at you as a person, as a driver, as everything. It really represents me massively for everything that happened. Nico ROSBERG: It definitely helps to have been there, done that, y'know? This is the third time that we're fighting for the Championship and the second time that it's gone to the wire so for sure that helps to feel more relaxed. Rosberg: Wow, that's a bit of a question. I'll need a bit more time to get into that because I don't know really, I'm not thinking back. Of course, he's done a great season, there's been a lot of great races that Lewis has done, for sure. He's been a great competitor, tough opponent as always, as was to be expected also. Yeah, but for me it's just a focus on this weekend. Q: Well, the performance, in other words, on any particular weekend. Hamilton: I can't really remember. Same as him. He was quick in lots of different places. I don't think there's one that particular stands out. Q: OK. We were just talking with Kimi Raikkonen, his 2007 Championship very unlikely given you and Alonso were leading going into that race. Another unlikely one was here in 2010, where Vettel was the least fancied going into that weekend and he came out as the World Champion. Do you take confidence from those two turnaround events, so say that anything is possible in this scenario? Hamilton: Not really 'cos, I mean... it doesn't really make any difference to this weekend. Q: (Seff Harding - Xero Xone News) Good afternoon, this question is for Lewis. Lewis, if you win this weekend this in win number 53, you inch closer to Schumacher's record. If things don't go the way you hope you will this weekend, would that be a bittersweet ending to the season for you? Hamilton: Well, firstly Michael's a long, long way away, so it will be a millimetre step closer to Michael. And if I... that's my sole goal this weekend, is obviously to win the race. Nico's been really quick here the last couple of years so it's something that... it will be a challenge for sure but one I'm certain that I can face head on and do well. In terms of the Championship, if it doesn't go the way I'd hope, well, the Championship generally hasn't gone the way I'd hoped up until now. So 2016 has generally not been a spectacular year but there's been lots of positives to take out from it and either way I will take all the positives into next season. Q: (Andrew Benson - BBC) To both of you, Lewis has obviously had worse reliability this year out of the two of you and would be leading on points even if Malaysia hadn't happened. Nico, how would you feel about the perception that that's facilitated your championship win if that's the way it happens. And Lewis, how do you feel about that too. Rosberg: Of course I'm aware of how the season has gone for both of us but those thoughts... first of all the season isn't even finished. We still have one race to go so it would be premature to get into any such discussions but anyways, such thoughts, I don't have them at the moment, in any way because for me it's about concentrating on myself this weekend. I'm excited because it's the last race, fighting for the Championship again with Lewis and yeah, so I'm just really focussed, trying to get the job done. I really would like to win this race and finish the season with a win. That would be awesome. Hamilton: Well, I mean... I don't know. For me it's... as I said, it's been a challenging season in terms of having the ups and downs that I've had but I think that I've really managed to strengthen. In terms of turning negatives into positives, this year has been a real challenge in terms of strengthening that tool and being able to do so. So I'm really proud of what I have achieved. There have been moments where in the year where... 43 points behind, thought it was impossible to come back but somehow turned it around. I've been 33 points behind and almost turned it around. So, I think this year has generally shown that, for me... continued to show me that anything's possible if you put your mind to it. I'll keep the facing the races that are coming with that mentality. Q: (Heikki Kulta - Turun Sanomat) Nico, is this the most important ever for your whole family? Rosberg: Ha! That's a pretty easy one to answer. First of all I'm surprised you didn't pull out a statistic. That's very surprising. Secondly, no, for sure it's not the weekend for my whole family, that's very, very easy to answer, and that has become more clear also with the birth of our daughter. Q: (Jerome Pugmire - AP) Question for Nico, given that you've finished runner-up twice and are in a dominant position coming into this race, if you do finish second, would this be the most bitter of the three runner-up positions that you've had. Rosberg: Again, why...? That's not going to make me go faster to have such thoughts y'know? About something that might or might not happen in the future. For me what's important is now. And that's worked for me until now, and that's why I'm in this position, fighting for the Championship right here, because of that approach. So I'll stick with that, continue and focus on a race win this weekend. That's it. Q: (Jonathan McEvoy - Daily Mail) To Nico. Can you say that you won't get involved in any dodgy driving or with it all on the line is it no-holds barred in this last race? Rosberg: Again, it's none of what you just said. It's going to be a weekend like any other where I'm going to go for the race win and do what it takes to get that. And that's it. So whatever's needed to do it, is it? Within the limits of what's acceptable of course. Rosberg: If it's OK I'm just going to dig into the best, I prefer that one. One of the highlights for me was Singapore definitely this year because it was just a weekend I really... in an important part of the season also which really went my way. In qualifying then in the race the pressure from the Red Bull and still getting the win. In the end that was one that I really like to look back on. Hamilton: Can you remind me of the bad races I've had? I'm sure there's been some bad ones but I can't... someone. Seriously. I don't want to just discard the negative ones but I need a bit of help with the memory. Singapore. Baku as well - that wasn't really might fault, I had a dodgy engine setting. I think it's important for me definitely to try to remember the negative ones because those experiences are generally what help you realise, or appreciate more, the wins. I'm sure there's been... if I look at Japan for example. Getting off the line terribly, there's been several races like that but regardless of those really bad starts I've always come back through with a fighting spirit and that for me is something to be proud of when I finish the race. That I've given it everything, regardless of the stumble or the mistake at the beginning. One of my favourite races was Monaco, I think. In tough, tricky conditions in the rain in Monaco and then wet to dry, staying out ahead of Daniel was a serious challenge and one I really loved. Q: (Simon Lazenby - Sky Sports) Lewis, you mentioned your starts there. If you aren't to go on to win this championship, will you look back and how much responsibility personally will you take for it, along with perhaps the reliability issues that have cost you? Hamilton: I won't really look back. When I get to the end of the season I'll be looking forwards. I generally don't dwell to much on the past. I can barely remember the races so there's not really much to look back on and dwell about. But you know I've learned a lot this year, grown a lot, my relationship with my engineers, my new mechanics that I have, that relationship has also grown a huge amount, so there has been lots and lots of positives. I'll look into another year. The furtherwe go on in our age, the less championship fights we'll have, or opportunities we have, so naturally you want to utilise every single one but if I was to look back on the season, I would mostly look... if there was anything to be negative about it would obviously be cars failing in certain places for... a car that just wouldn't stop through testing with the same engine to then have the issues we've had. But again, Mercedes recognised those faults and tried everything they could to try and rectify them and improve. We take that, collectively as a team, onto next year and hopefully we will be stronger and won't have problems like that. We are a team, we win and we lose together. As I said, I'll just be looking forwards into another season. I know my ability, I think I've shown in time and time again and I'll continue to do so in the future. Q: (Dieter Rencken) Lewis, one of the Twitter users by the name would like to know, would you consider backing Rosberg into the pack on Sunday, assuming you lead by Turn One, Lap One. Hamilton: Well, firstly I do really appreciate that you're using social media really quite a lot now. It doesn't mean every single question you give me is going to be from social media but I appreciate it either way. I was only just made aware of what Christian had said and a joke came into my mind, thinking I should say he gave me a call to discuss it... as we heard Toto had given him a call, or something, about the drivers in the last race - but I won't say that because it's not true. No, my sole goal, as I said, obviously Nico's been pole for the last two year here. He's been very, very quick. This has generally been a relatively strong circuit for me but I have not delivered in the last two years, so my sole goal is to do so, make sure I'm at my best this weekend as I have been the last couple of races. In terms of tactics in the race, that has to come on Sunday. I have to really think about that. But that's not really every been my thought process. I've always just really just tried to... if I'm out ahead I want to be generally as far ahead as possible. Generally when you have a 18s... 30s lead that's as painful a blow as you can give to the guy you're fighting. So, when you look at the last race, if we didn't have red flags I would have been 30 seconds ahead and those scenarios for me, it's more valuable, it's more of an achievement that backing up your team mate. Plus here, while in theory it sounds like it makes a lot of sense, practically it's not very practical to do. You have two long DRS zones here. Wouldn't be very easy and very wise to do so. So, no. Q: (Walter Koster - Saarbrucken Zeitung) Nico, on Sunday evening, the season will be over but let's come to the beginning of the season, but don't worry, I'm not going through the whole season. But at the beginning five mechanics from Lewis's team and five from your team left the team for Lewis. What was your impression of this change? Was it, at the end, a good idea during the season? What were your thoughts concerning this change? Were you surprised? Obviously you were not a fan of this change and who had this idea? Hamilton: That's a very good question. And I would also just like to add to it, what was the explanation given to you? Rosberg: So the easiest way to answer that is if we look at the recent team spirit within the team because you know we've been fighting now for three years and within the team they've been fighting for the race wins and for the championship so it's quite natural that a little separation can happen between the two sides of the garage and for the overall team performance that's not a good thing because for the overall team performance you'd want to have great team spirit, everybody fighting for one direction, everybody holding together and that's why the decision was taken to rotate a little bit and I think it's shown this year that it's been a very very good thing to do because our team spirit has been as good as ever, we've seen that recently and we've had some great parties together and whatever. Everybody's just sticking together and it's an awesome feeling within the team so it looks like that it was the right thing to do, even though initially it's not something that's super comfortable because my mechanics are close to me and it feels good and everything; to then change takes a little bit of time to gel as Lewis touched on before but I understand that from a team's perspective that was the right thing to do and it's worked well. Hamilton: You'll have to buy my book down the line in ten years time when I tell you exactly what happened. It will be an interested read. Q: (Rene Hofmann - SudDeutsche Zeitung) Lewis, Nico, could each you just briefly talk about your relationship developing during these three years of fighting for the championship against each other, please? Hamilton: Yeah, it's been an interesting one. We obviously had a very good relationship generally when we started out, when we were kids. Back then a race weekend was generally... for kids karting it's... you're out having fun. You go out and drive and you come in and you fool around, you give a bit of information to your mechanic and you go and play Playstation or you go unicycling. We had a lot in common. We both love pizza, we loved eating boxes of Kellogs Frosties and doing all the crazy things and we go out on big motorbike tours. We did all those things. I still do everyone of those but Nico has shifted in the sense that he's very very solely focused in terms of looking after himself. And obviously we went quite different ways when we were young: he went BMW, I went Renault. But then we got to Formula One and this was something that we had spoken about as kids and yeah, we obviously had ups and downs but ultimately I think we've managed to - particularly in the last year and at the age we are - which is pretty old, considering when we first met - I think we've been able to manage it pretty well and I'm really happy for him and his family and proud of stepping away from being our competitive selves, proud of him of how he's driven, particularly this year obviously and generally it's been a pleasure having him as a teammate. Rosberg: The thing is that we still have from back in those days is the base respect and that will never go and that has definitely helped us through these years. For sure, I have a lot of respect for Lewis outside of the car and also inside the car. As I've said, we've had some difficult moments but also some good ones over the past years and this year, generally, I think we've made progress and so yeah, it's generally neutral but of course it is a difficult environment. Q: (Reem Abulliel - Sport 360) Lewis, I know you're friends with Serena Williams, she's an inspirational figure, someone who's had a long career. I was wondering if you've spoken to each other about your respect for sports, what kind of things can you learn from Serena or maybe be inspired by her? Hamilton: I was actually with Serena last week in LA. For me... she came out to Mexico which for me was a real honour to have someone of her power, someone who has achieved so much. She's been through... kind of come from similar backgrounds, similar relationships with their parents, being their father figure, being the lead. Growing up watching her career, absolutely being inspired by her and still today by her drive and her sheer... just, she's if not the greatest athlete we have of our generation today so very proud to have had her there and be friends with her. We generally don't talk... we generally have a lot of fun when we are around each other. We're always laughing and joking and enjoying life away from sport, so it's generally not something we generally talk about, although because she's been to a Grand Prix she's generally really interested in cars now and she has asked me a lot of questions about how it feels and all the technical things about Formula One, because she was there, she perhaps didn't understand everything that was going on, it was her first Grand Prix. But yeah, I'm absolutely mesmerised by what she has achieved and definitely inspired by her as an athlete and as a human being and so trying to learn from her. Every now and then she'll give me a bit of that magic in her words. Venus talks a lot about wisdom and about her growth and about the process of being a sportsman or sportswoman so generally from both of them, I take a lot of inspiration and admire them both hugely. Q: (Heikki Kulta - Turun Sanomat) Lewis, the very sad news from last week (of the death of Dr Aki Hintsa); did that affect your preparations? Hamilton: The last week, particularly, was definitely a difficult week. Last week definitely wasn't the best week of sleeping, for sure. I'd known Aki since 2004 I think it was, so I'd known Aki quite a long long time, very close with him and his family and I was very very fortunate to have been able to be there with him and his family in the last days and actually get to see him on the last day of his... On the Monday after Brazil, I got to see him and spend time with him and we played music, get to see him smile, get to see the amazing man he was. You know, proud to have known someone like that and have someone like that in your life, who had been hugely and incredibly helpful in my time. He was very instrumental in me getting that seat at McLaren in Formula One as he'd built a really strong relationship with Ron and Ron was kind of of a mind to say that if Aki says you're ready then I believe you're ready, so Aki would take me through all these tests and he would look at me deeply in my eyes and like 'yeah, you're ready, I can tell.' So I have all these great memories with him and for sure it's... we don't know why these things are sent to ... such wonderful people as well. You hear about prisoners who have done the worse things who die happily in their sleep and then you hear about someone who is almost a saint like Aki, who would help... who would go to Ethiopia and help children and has helped so many people and affected everyone that he had met in a positive light. To have finished his life so early was definitely tough to see but coming here this weekend, whilst I have that fighting spirit in my heart from the last races I've done, I come here with almost double the power in the sense that I feel that I want to win this race more so for him. We were texting every single race through his battle and particularly the last race on Sunday. Yeah, so coming here this weekend, whilst it's an emotional time, I'm here to try and do him proud, do well for him as he had helped prepare and the belief he had in me. Q: (Livio Oricchio - GloboEsporte) Lewis, did you study the history of this race. In 2010, for instance, Alonso lost the World Championship because he could not overtake Petrov and so it's very important to be in front of Nico. Maybe you need that. Do you think you do any special preparation for that? And the second question for you is that in 2014 you had a kind of magnetic field around you, we could not approach you because it was dangerous for us. You were so nervous, we could see that. In the weekend here, 2014. Hamilton: Yeah, it was horrible. Q: (Livio Oricchio - GloboEsporte) We could see that. And now it looks like everything... except that you are fighting for the championship. Hamilton: In terms of studying the race... the engineers obviously know the history of this race and where have been the good and negative points, the things that I can work on for this weekend so I'm fully up to date with that. Generally there's one line through the first sector, for example, it's very hard to follow, you pretty much need a one second, a 1.1s advantage over the car behind so that you can be in a position to overtake the car ahead so there's quite a big delta compared to other races and it makes it very tough, hence why I am coming here to make sure I'm on first place on the front row which is... as I said, very much aware of how difficult it's been in the past but with the belief that I've been able to do in the last races I believe I can do it here and I know that I can do that here so that's the goal. Q: And the second one was the... ah, 2014. Yeah, it was a turbulent year again. I remember... was that the year that we had the issue at Monaco? Right. So we had the issue at Monaco and then there was the issue at Spa, so we went through quite a lot of ups and downs again that season and then to get to the last race where it was double points... I didn't sleep the night before the race which is one of the first times if not the only time. Yeah, I'd worked so hard... we'd worked so hard, me and my mechanics and engineers, so hard that season to be at the last race and through mechanical failure or something, to have the championship taken away from us... we fully deserved it. I'm pretty sure it was definitely difficult then. Coming here this year is a lot different. I fully believe me and my side of the garage have worked the hardest and yeah, we are not in the position which we've worked for but we are still in a position of power, we are still pushing hard, we still aspire to motivate, we're still very very focused on winning. I'm very very proud of my engineers. I think, as I said, we've grown a lot closer this season than ever before. I think our work ethic is greater than it's ever been, and my new mechanics that have come on board, I feel I've really... it started out really tough with us at the beginning of the year, particularly, I would say, on their side because they just didn't understand what's going on and then we had all those problems following, so then they felt on their social media, they felt a lot of heat, fans thinking... people were blaming them which was nothing to do with them. And then we had a lot of success so I built a really great relationship with them, so really really proud of the unit that I have now and of course I feel that we have worked to the point of deserving to have been champions this year as our group but we have this one last race which, all we can do is focus on being great this weekend as we have the last races before. We've really grown into a solid unit and continue that way. 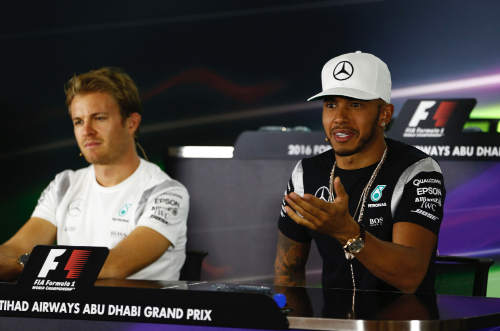 Hamilton: I like these press conferences when it's just us two. Rosberg: I don't think you would be saying that if you had been out in the race car with us. You wouldn't call that conservative. Q: (Seff Harding - Xiro Xone News) Are you prepared to deal with that, given the Red Bulls may have a chance to split you two and make things interesting for this title fight? Rosberg: I'm here to win, not think about who might or not come between or be right behind me or whatever. No, I'm just here to win and I know that with the car that I have and the form that I'm in, I can make it happen and I'm just focusing on that. That's it. Q: (Ralf Bach - AutoBild Motorsport) Nico, be honest, what is more important for you here: winning the championship or a victory? Rosberg: For me, here, the most important thing is to do an awesome performance, because that's going to give both, isn't it, so I'm doing whatever it takes to give the best possible performance and that's the same thing that I've done for all the other races. Taking this as one more race, keep it simple, focus on going for that race win and putting everything towards that and not thinking about what if, because that wouldn't be the right approach for me and that's what feels good to me and that's what I'm sticking with. Understandable?